BullGuard for Windows XP - a set of programs designed to protect the system. Includes backup module, antivirus, antispyware. You can reject banners, block hacker attacks, copy important data. Interacts with removable media. Software involves scanning the system offline. After installation, existing threats are identified. About the detection of worms, trojans, spyware utilities reports an audible signal. 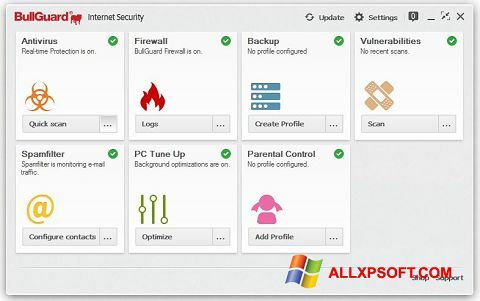 You can free download BullGuard official latest version for Windows XP in English.